Okay, it’s taken me a while to get back to this blog, but I promise I will be more diligent about it in the future. This particular post is a little bit out-of-date, but it’s still worthwhile (that is, if you like stupid…). Keep an eye out tomorrow for a much more important and relevant post. There have been a couple of signs around Oxy recently that really make you doubt the intelligence of your fellow human beings. For example, take the one above. The above sign was hung in the Cooler for Coming Out Week last week. Clearly, judging from the neatness of the sign, its creator took a whole five minutes making it. Judging from its spelling… I don’t even know what to say about that one. 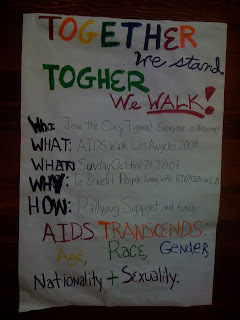 How do you spell “together” correctly once, but then spell it wrong the second time? Look, I don’t mean to be critical, but if your sign is important enough to hang in the Cooler, and it is therefore of enough worth for someone to take a few moments of their time and read it, you have to care about it enough and put enough effort into it to warrant that. Though this sign may have a worthwhile message, the fact that whoever created it clearly didn’t give a crap takes away any significance it might otherwise have. And the fact that nobody spell checked the sign before putting it up there for the world is just all-togher stupid. 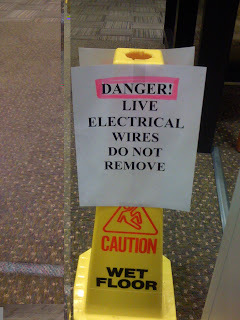 I’m sure there was an important reason for this sign, but I didn’t see any live electrical wires anywhere. Were they talking about wires under the half-exposed carpet? If so, someone would have had to have actually gone down and worked their fingers though the seam in the carpet to get to the live wires. Do they really think that someone would do that? The other sign made us wonder how stupid its creator was; this one makes us wonder how stupid its creator thinks we are. Obviously, this sign isn’t nearly as outrageous (or high-profile) as the last one, but it definitely falls under the “too alarmist?” category. This entry was posted on October 19, 2007 at 10:10 pm and is filed under Uncategorized. You can follow any responses to this entry through the RSS 2.0 feed. You can leave a response, or trackback from your own site.